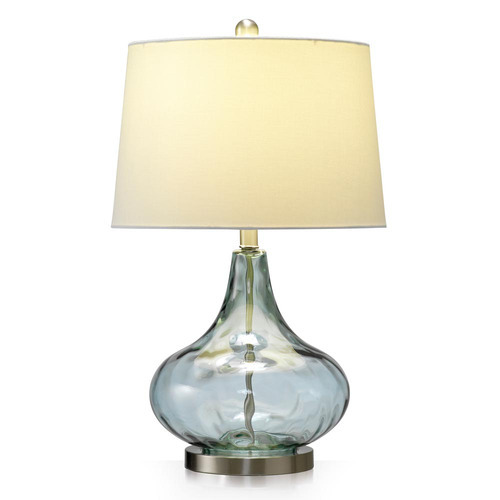 The Dew Drop Glass Table Lamp has a subtle texture and is finished with a chrome base and top. With a 50’s yet modern vibe, this classic table lamp will be a stand out piece in your home. The Misty Blue Dew Drop Table Lamp is a Coastal style product. Coastal style is exemplified by perfect for a beach or lake house or coastal design features whites, blues, and sandy neutrals. Motifs such as shells, coral, sea life and nautical instruments complete the look. 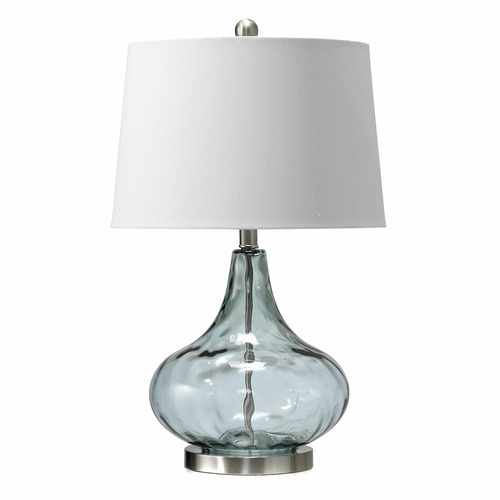 You can shop for more Coastal Lamps in the Lighting section of our site. When you buy a Misty Blue Dew Drop Table Lamp online from Temple & Webster in Australia, we make it as easy as possible for you to find out when your product will be delivered to your home in Melbourne, Sydney or any major city. You can check on a delivery estimate for the Temple & Webster Part #: BM0072 here. If you have any questions about your purchase or any other Lamps product for sale our customer service representatives are available to help.Whether you just want to buy a Misty Blue Dew Drop Table Lamp or shop for your entire home, Temple & Webster has a zillion things home. The 3 stars should be 5 as I love the lamps, however packaging was very inadequate and did not protect one lamp during transit as it arrived with a hole in one of the boxes and this shade was cracked, plus visible small holes. Photos of proof were forwarded to Temple and Webster and I later realised there were further cracks that I didn’t photograph. As there were no further lamps in stock and I had purchased a pair I accepted a part refund for the damaged shade. This refund will in no way pay for one replacement shade, let alone two, as I will need to buy 2 matching shades, so more expense! Temple and Webster were responsive and my recommendation would be for Temple and Webster to confirm with their numerous partners that packaging for fragile items is totally secure, as even though I paid for insurance the part refund does not replace a damaged item, especially as a matching pair are part of my full package. These lamps are lovely and make a great statement in my master bedroom. They completely match the description on the website. The ordering process and delivery all went smoothly with the lamps arriving exactly as predicted in the confirmation email. I will order again from Temple and Webster. I have just moved into a new house so I have bought all new bedroom furniture. I have always had so so lamps. I never liked to spend too much money on something that just sits beside your bed. Well I received my lamps today, took them out of the box and thought just how beautiful they are. Exquisite and they look absolutely gorgeous on my new bedside table and wilth my new bed linen. If your look and think mmm I might get them, wee do yourself a favour and buy them. So happy with my purchase. Beautiful simple lamps. Larger than I thought but size worked out even better. Very happy with this product and great service from Temple & Webster. Fast delivery. Well packaged. Happy to recommend. Very happy. Looks great. Soft blue swirled glass is a feature. Looks great but the shade is a bit loose and can't be straitened properly. Beautiful lamp, exactly as expected. This beautiful lamp looks exactly like the photo and is high quality, true to colour. A beautiful pice for my living room. Have received lots of compliments but have removed one star as on/off switch is very stiff but overall a very nice lamp.